Buying a commercial cleaning franchise in Edmonton is a big decision. You’re making the jump to be in business for yourself. Although it might be a scary decision, it’s a great one as well! Purchasing a franchise business that’s for sale comes with many advantages. The best part with a JAN-PRO franchise is that you can work close to home. Marjorie (right) with Regional Director of Edmonton, Al (left) started her franchise in 2017 and with 6 months grew her business by 4 times! JAN-PRO is a #1 home based franchise business as you do not need to have an office to run your commercial cleaning business. Our local Edmonton area has an office, but we take care of anything you might need, in that office. This is included in your investment. First, we offer you accounts. That means that you don’t have to do any sales calls to build your business. Once we know the area that you’re in, we offer you available accounts that the office has sold. However, you don’t start receiving account offers until after you’ve completed training. JAN-PRO has one of the most extensive training programs in the commercial cleaning business, and it’s included when you invest in your franchise. Your initial equipment kit is also included in your intial investment purchase. 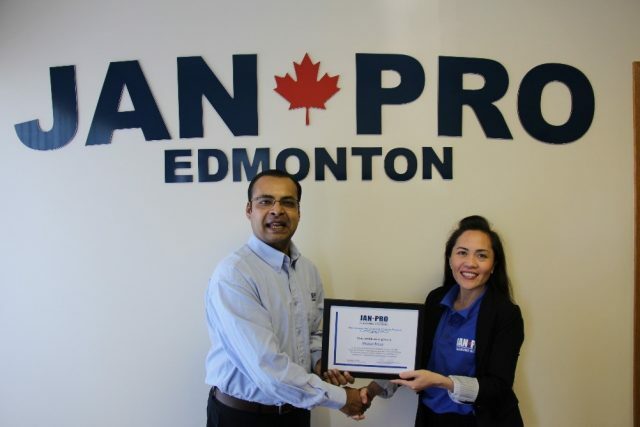 Once you start receiving accounts, the JAN-PRO Edmonton offers takes care of all administration, including billing, collections, marketing and more. Do you think you’re ready to buy a franchise cleaning business? Contact JAN-PRO Edmonton at 780-757-5800 to get started!